Ready-to-use, high performance adhesive paste for laying ceramic tiles of all types on indoor walls and floors, and outdoor walls. - Fixing ceramic tiles of all types in medium and small sizes, on indoor walls and floors. 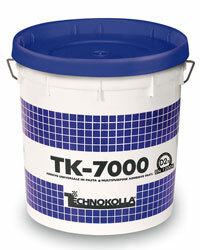 - Fixing ceramic tiles of all types in medium and small sizes outdoors, on walls only. - Fixing insulating panels made of polystyrene, polyurethane foam, rock or glass wool and cork on absorbent substrates. Cement-based or gypsum-based plaster, plasterboard, wood, cement-lime mortar, concrete, cellular concrete, anhydrite screeds, heating screeds.